The tiny town of Kimberley in the East Kootenay region of British Columbia has, nestled at the base of the ski hill, a gem of a restaurant. The Old Bauernhaus has been voted the best restaurant in the Kootenays in 2014 and is also a member of the Slow Food Movement. The unique bit of history about this restaurant lies with its original German owners who, before immigrating to Canada, bought the 350 year old Bavarian building that in its previous incarnations was a barn, a bar, then a home, and a witness to the black plague in Germany. 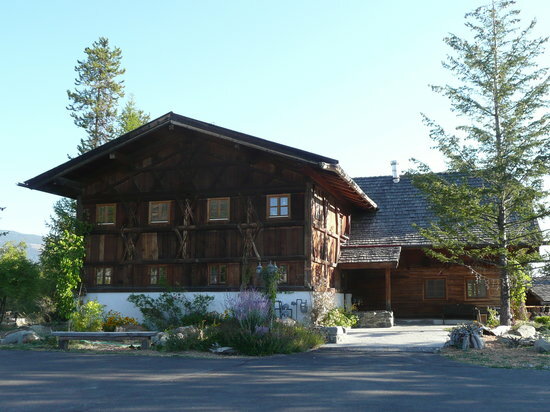 The couple dismantled the entire structure, and in 1989 shipped it to their new home in Kimberley, then piece by piece put it all back together in its present location on the road leading up to the ski hill. The original owners still live upstairs and lease the restaurant below to the current husband and wife chef team Nils Fuhge and Michelle Klassen who met when they were taking their culinary training in Switzerland. The food still leans entirely towards German fare with everything house made; the mustard, pickles and sausages, to the most incredible sourdough breads (made from a 35 year old sour) I have ever put in my mouth. All their meat is locally sourced and organically raised, the same for the vegetables. Because my daughter and her husband live in Kimberley, and so conveniently across the street from the Bauernhaus, this is where we go for at least one dinner out dinner during our visits from Vancouver Island. 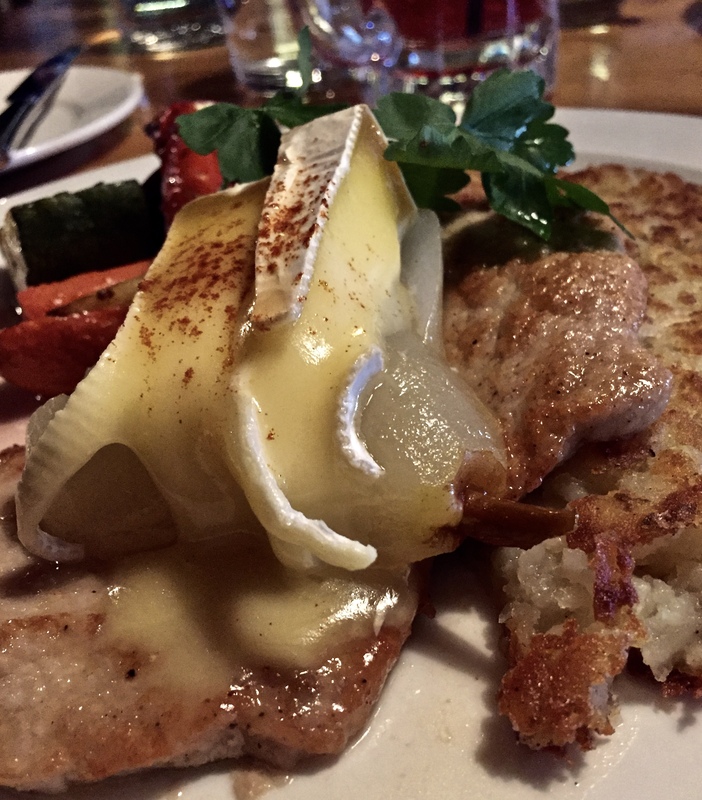 On this occasion my daughter and I each had the Schnitzel Munich, a lightly breaded local free range Pork Schnitzel with poached pear, Brie, and Rosti potatoes and pear jus. Her husband had Jager geschnetzeltes with pork, shallots, fresh mushrooms, white wine sauce and spatzle. My husband had the nightly special, which I can’t recall exactly (I should’ve taken notes since this wasn’t on the menu), but I do know pork was also involved, I snuck a taste and it was, along with everything on our table, extraordinarily succulent and perfectly prepared. Nothing pretentious at the Bauernhaus, just clean and simple food, prepared with great care and skill. We had to have dessert. After a day of skiing or hiking depending on which season you find yourself in Kimberley, make a reservation for dinner at the Baurenhause for really good food, really good ambiance, really great people. Pork Munich -Pork Schnitzel with Brie and Poached Pear and Potato Rosti and perfectly cooked selection of veg. I wanted to dig in so fast but I had to put down my fork to take a photo!